Preserving units are divided into 2 categories: water bath canners and pressure canners. 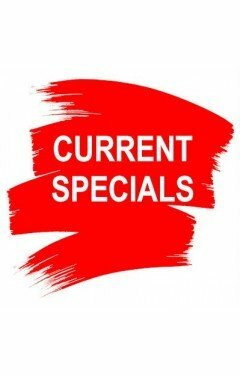 Water bath canners are exclusively for use with acidic foods. Pressure canners must be used to preserve non acidic foods. 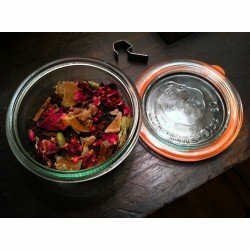 We also have kits for other types of preserving such as dehydrating and fermenting. 1 litre (exact capacity 1062ml) Weck Preserving Deco Jar. Takes Large lid and seal.Choose either the option of purchasing the jar only or the jar complete with glass lid, natural rubber seal and 2 stainless steel clips.Weck reusable Glass Jars are of the highest quality and contain NO BPA (Bisphenol A).These jars are suitable for water bath only and the deco jars are not recommended for pressure canning or freezing.Weck canning jars are made with thick glass to withstand boiling, sterilizing and processing over and over again. Glass lids preclude issues with rusting, and the t..
1 litre (actual capacity 1062ml) Weck Preserving Tulip Jar. Takes Large lid and seal.Choose either the option of purchasing the jar only or the jar complete with glass lid, natural rubber seal and 2 stainless steel clips.Weck reusable Glass Jars are of the highest quality and contain NO BPA (Bisphenol A).These jars are suitable for water bath, and pressure canning. With the added bonus of being able to freeze and bake. The most versatile and beautiful preserving jar available today. Aside from their uses for preserving, tulip jars are ideal for dry storage, floral d..
1 litre (exact capacity 1062ml) Weck Juice Bottle. 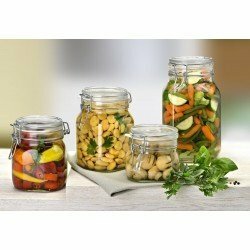 Takes Small lid and seal.Choose either the option of purchasing the jar only or the jar complete with glass lid, natural rubber seal and 2 stainless steel clips.Weck reusable Glass Jars are of the highest quality and contain NO BPA (Bisphenol A).These jars are suitable for water bath canning. 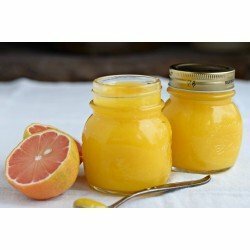 A fabulous way to present freshly squeezed juice, smoothies or wine.With a glass lid there is no risk of corrosion or contamination from the lid.Weck canning jars are made with thick glass to withstand boiling, sterilizing and processi..
An extra wide mouth gallon jar with close to 4 litres capacity.Great for bulk canning, fermenting, dry storage, cookies, candy and terrariums. Often used for pickles, pickled eggs, kombucha, and various bulk storage items. 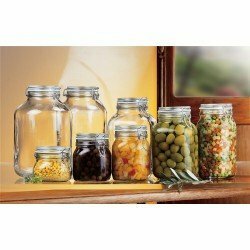 Wider than wide mouth home canning jars (86mm), these jars take 110mm closures. Lid colour may vary according to availability, please contact us if a particular lid colour is required. Made in the USA!​ Capacity 128oz (approximately 3800ml) Takes Lid 110mm CT available in foodsafe coated tin Height 25cm Outside diameter 15.5cm Label panel height 14c..
140ml Weck Mini Mold Tapered Jar - 761 - SingleWeck reusable Glass Jars are of the highest quality and contain NO BPA (Bisphenol A).These jars are suitable for water bath, and pressure canning. Weck jars are the only jars which are able to be used in the microwave, baked and frozen. Mini jars lend themselves to many uses including for preserving small samples, for serving condiments or mouthful size portions of delicious desserts.The most versatile and beautiful preserving jar available today.Choose either the option of purchasing the jar only or the jar complete with gla..
160ml Weck Tapered Mini Jar - 760- SingleWeck reusable Glass Jars are of the highest quality and contain NO BPA (Bisphenol A).Choose either the option of purchasing the jar only or the jar complete with glass lid, natural rubber seal and 2 stainless steel clips.These jars are suitable for water bath, and pressure canning. Weck jars are the only jars which are able to be used in the microwave, baked and frozen. 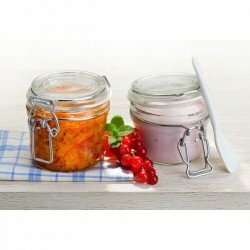 These mini jars are perfect for presenting gift size portions of jams and jellies or simply to serve a small but delicious morsel.The most versatile and beautiful preserv..
165ml Weck Preserving Mold Jar. Takes Medium lid and seal. A perfect size jar for serving desserts such as creme brulee as well as an elegant way to preserve homemade jams, pickles and chutneys.Choose either the option of purchasing the jar only or the jar complete with glass lid, natural rubber seal and 2 stainless steel clips. Weck reusable Glass Jars are of the highest quality and contain NO BPA (Bisphenol A).These jars are suitable for water bath, and pressure canning.The most versatile and beautif..
Weck reusable Glass Jars are of the highest quality and contain NO BPA (Bisphenol A).These jars are suitable for water bath, and pressure canning. With the added bonus of being able to freeze and bake.Mini tulip jars can be used for not just preserving but they are also very popular as serving jars for such things as yoghurt, desserts and shrimp cocktails.The most versatile and beautiful preserving jar available today.Weck canning jars are made with thick glass to withstand boiling, sterilizing and processing over and over again. Glass lids preclude issues with rusting, and the..